Vine Spa offered in Za Rodinu village of Krasnodar region.The Vine Spa Za Rodinu is one of the pioneers of Vinotherapy in Russia. Vinotherapy, the latest movement in spa treatments, uses grape mixtures to soothe skin and slow the aging process. Scientific research shows that wine grapes are the perfect fruit for skin conditioning, as they are very high in anti-oxidants, particularly polyphenols and resveratrol. 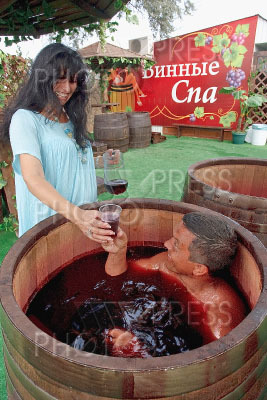 Pictured : Vine Spa Bath - vine is good both as a bath and a drink.